Roof cleaning in Tampa is a competitive business, but not all companies are the same, and some can even damage your roof. That is why you should choose Peerless Pressure Washing as your roof cleaner. We use the gentlest methods to ensure a longer life for your roof. We do not use rough, high-pressure sprayers or loads of harsh cleansers, and we rarely walk on the tiles the way another roof cleaner might. Those methods can fade, weaken and break roof tiles and shingles, and even void your roof’s warranty. The key to our success is a true understanding of what stains roofs: mold and algae. Our method, the Peerless Process, completely kills the organisms that damage tiles and shingles, which can actually extend the life of your roof. After assessing the extent of algae growth on your roof, we custom blend our special gel, Peerless Punch, for optimum treatment. We then use a pump with a 50-foot reach to apply it, meaning we rarely have to set foot on your roof’s delicate tiles or shingles. We are also licensed painting contractors, meaning we have been tested, back-ground checked and keep all of our documents current with the county. As painting contractors in Tampa, we understand what soaps and detergents to use with the paints and coatings that have been applied to your home. In addition, our gel is approved by the Asphalt Roofing Manufacturers Association and meets the requirements of two major roofing manufacturers, Gaf and Monier, so your warranty will still be valid when we are done. At Peerless we understand that your property is your largest investment, so we take good care of it when we clean your roof. While we are roof cleaning at your Tampa home or business, a Peerless roof cleaner continuously monitors and rinses any run-off to avoid damage to your landscaping, windows, and siding – a step that is usually skipped by other roof cleaners. Our roof cleaners are not subcontractors, they are fully covered employees of Peerless Pressure Washing Inc.
Our commitment to you does not end after we pack up and head out. The beautifully clean roof we leave behind has continued protection from the residual algaecide Peerless Punch supplies. This blocks any new growths on your Tampa roof. In fact, we are so confident in the effectiveness of our method that we offer a one-year guarantee. If any molds or algae grow back in the year following our treatment, then we will come back and do it again — for free. Here are some great pictures of some recent projects we have completed. 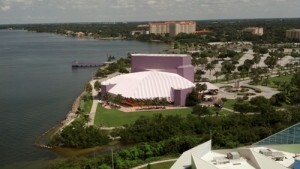 The Purple cow was a large roof cleaning for the City of Sarasota. This was our second time cleaning all of the roofs and we also painted much of the building and sign. 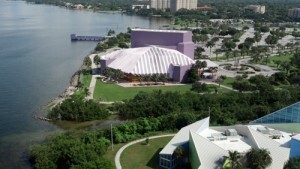 Peerless Roof Cleaning Sarasota offers HOA roof algae discoloration violation removal service. 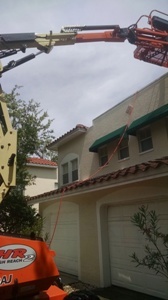 In the next picture you can see a large condo roof cleaning in Westchase. 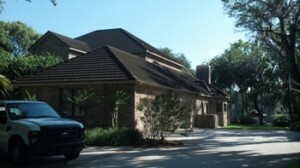 Our professional service was hired to clean all of the roofs in the entire complex. The condo’s have cement barrel roof tiles and were covered with algae discoloration. 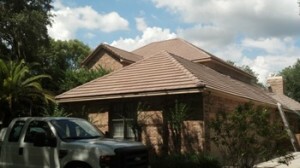 Peerless Roof Cleaning has been serving Westchase residents for well over ten years. This project was located along the beautiful Westchase Golf and Country Club. Roof Cleaning Lakewood Ranch for a HOA. The Peerless crew was awarded the contract to provide non pressure roof cleaning for all of the condominiums, including all of the driveways and sidewalks. 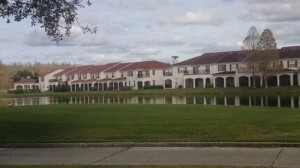 This was a large project located in beautiful Lakewood Ranch FL consisting of 21 individual condos. The HOA insisted that we do not walk on the tiles under any circumstances. In the picture you can see the high reach man-lift we used to avoid walking on the tile. 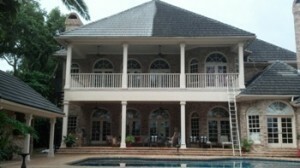 Peerless Pressure provides Lakewood Ranch roof cleaning services for residential homes and commercial buildings. Contact us today at 813-230-5915 to inquire about our Tampa roof cleaning or house painting services in Tampa and the surrounding areas.